Backed by a fifth-generation family-owned company, Spicers Canada is a leading distributor of commercial print and business papers, specialty products, graphic solutions, sign & display media, and industrial packaging products. Our employees are passionate about our business and understand exactly what it takes to consistently deliver world-class service and support. We’re based in Vaughan, Ontario, with 15 regional centres that include sheeting facilities in Toronto and Winnipeg, as well as Cash & Carry locations across the country. Partnering with trusted global manufacturers, we source, stock, market and distribute a diverse range of quality products while adding value to our customers through an efficient supply chain. For the past 100 years our expert and friendly staff have provided products, services and support to customers across Canada. We employ almost 500 employees across Canada that are united by a common set of Principles. Pursuit of relevant solutions that improve profitability for our customers, suppliers and employees. Innovation and progress begin by extending our comfort zone. Providing the highest standard of work creates an undeniable competitive advantage. Pursuit of a structure easy to understand and free of internal and external barriers. Clear communication of expectations and vision assures efficient execution. Ownership of how our strategy is administered lies at a local level. Our Vision: A respectful corporate culture and a reliable brand recognized for its value. Our Mission: To continue our role as a leading distributor in an evolving industry, while fostering regional empowered business units that keep us flexible and responsive. These values are shared by all of our locations across Canada, each operating seamlessly within the Spicers family. We’re able to achieve this unity thanks to the commitment and loyalty of our employees. Our parent company, Central National Gottesman Inc. (CNG) is one of the world’s largest distributors of pulp, paper, packaging, tissue, newsprint and plywood. The company employs 2380 in more than 150 locations in 48 cities across North America and in 26 countries around the world, including 43 warehouses and 48 retail stores. CNG operates through three divisions: The Central National Division, a global distributor of pulp, paper, newsprint, packaging, tissue and plywood; the North American Distribution Division, comprising four regional paper distributors which supply a range of paper products to large and mid-sized commercial printers and corporate end users; and the North American Publication Division, which supplies paper to the book, magazine, catalogue, retail and direct mail industry. Visit cng-inc.com to learn more. 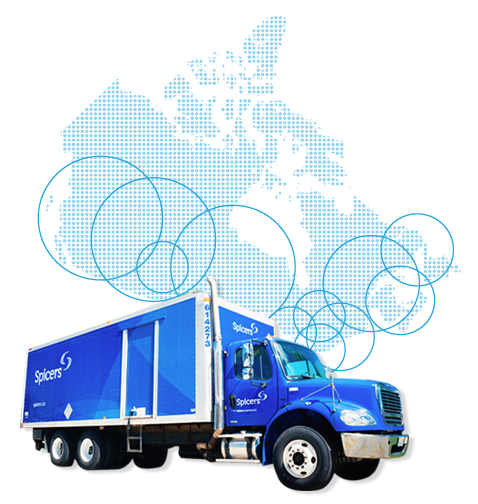 CNG’s Spicers Canada Acquires Shippers Supply, Expanding Product Mix throughout Western Canada.